I’ve decided to make a list of updates in the free version of EBF4, since some of them are easy to miss. Obviously this list contains spoilers if you would rather find all of the changes yourself. • NoLegs and the other cats have been re-skinned. • Jellies and Green Slimes have also been slightly re-skinned, along with most of the returning bosses from EBF3. • You now start the game with enough money to buy a few items. • Secret jungle area has lower level enemies now, because people were going there earlier than I thought they would. • Copper Fish and Slingers are no longer weak against thunder, because thunder was overpowered at the start of the factory. • Some equips nerfed (like the Alchemist bow), others improved (Alchemist staff, Cursed Armor etc). I don’t remember all of the changes… but a lot of weapons which were quite useless now have higher stats. • Many of Anna’s skills were improved in either power or chance of status effects. The Sawblade skills also have a higher chance of instant death. • Damage numbers now change color if damage is effected by resistance. Yellow for super effective, dark gray for not very effective. • The option to disable tips is back. • Equip type is now shown when buying at a shop. • “Sell All” button added to item shops. • A new battle theme is used for the ??? and early Godcat encounters. • Furry Slimes are found in many areas now. • Kitten Igloos guard the entrance to the factory. • The mammoth is now obtained by fighting the mammoth. • Jack is a jungle miniboss now. • Kitten Trojan Horses guard the entrance to the jungle. • Sandworm is the boss of the beach area now, and guards the stepladder. • Protector summon is obtained after fighting the Protector, after getting the 4 temple orbs. • Hydra is found in the graveyard after getting the flying boots, and can be used for level grinding. 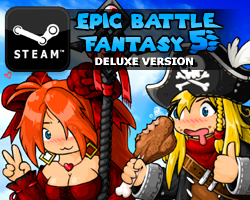 This entry was posted in Epic Battle Fantasy 4, Game News on February 1, 2014 by Matt Roszak. Can’t wait for this game to finally get on Steam, I’ve been waiting to do a video series on it for a long time! Wow, there’s sure a lot just in the free version. Can’t wait for the steam release. 1. The guy in front of the Whitefall town shop wearing a birthday hat uses the word horde instead of hoard. 2. The Camo Skirt seems really underpowerered compared to everything else with only 25/25 defenses. The new changes occurred while I was playing the game!!! (for the 2nd time…) No harm to gameplay or saves! No Legs got fuzzy!,I thought he’d seen a ghost Wish I could get some AP back when I “forget”,why can’t more games look and play as good as this one?-K.
Good , a stronger godcat, becaue she is too easy even on epic mode on earlier version. Found a couple more small issues. - Dark players still do their idle animations even if foe idle animations are turned off. If ally idle animations are turned off, however, they don’t. - Protector charges its lazor… and does absolutely nothing with it (charge lasts 2 turns, it summoned backup on the first and casted Big Blast on the second. It charged and summoned backup a second time, but the backup turn was its last). This probably happened because I was playing on Easy, though. - Endless wave counter’s at 5 even though all I did was enter it and flee right afterwards. Is this the best place to report these or would you rather have them somewhere else? All of these should be fixed now. The new sword’s randomly giving Matt Auto-Revive status. I’m not sure if this is intended since it’s not listed under its effects and I am absolutely sure it wasn’t the Angel Pin since I had that on Natalie (they both procced on the same turn a few times). It’s supposed to, but I guess I forgot to add it to the description. what are the new swords? 1. why did u re-skinned the cats, jellies, and green slimes? they don’t look as good as before. 2. any more reasons to why the copper fish and slingers are no longer weak v. thunder? they looked perfectly fine before. 3. why nerf alchemist bow? it looked fine too. (all) enemies should be nerfed by all means. the only change that would go well in weapons is to buff (all of) them. 4. why did you make god cat stronger!!?? it’s worse for the new players than it was before. i felt that this ruined the game for beginners (…and it’s not going to look good). I hope the soundtrack comes with the steam release. even if it had very little new stuff. Well, that may sound kinda harsh but still. I am one of editors on Epic Battle Fantasy Wiki and it would be very helpful if you could provide us with full patch note of this changes as that would greatly help us with updating our articles faster and not miss and change (such as this minor weapon stat changes). I would be very thankful if you help with this. The one containing the mammoth now contains the Thor’s Hammer instead. The mammoth is in a new chest in Whitefall. Supernova and Protector locations have been swapped. If it helps, I could give you the code for all of the equips and skills, so you can see exactly what all of the stats are. I guess that would be very helpful. I am not exacle sure what you mean by code, and I am not a code-guy myself but I will just ask other editor if anything. Thank you for your help, and making this game even more Epic. hey Matt how come i saw foe when i start the game is it normal? Just finished checking out the new content on Kongregate! Finished all the bonus stuff (except the endless mode), and I am more than satisfied with the expansion. Most of the re-balances worked well, but I was only on play-through one due to a cookie wipe, so I was on Easy for all the fights. I will later attempt a more intense Epic Difficulty assessment of the new foes for my second pass, but I am fearful of what Dark Natz will do to my team. I want to take this moment to say that you are my #1 favorite game designer, and that the completion of your work is more exciting to me than my impending Birthday. I am saving money to buy the Steam version when it arrives. Keep being the best, Matt. The new/old compression isn’t working for me. Even on low quality, the game is unplayably slow on Kongregate now. 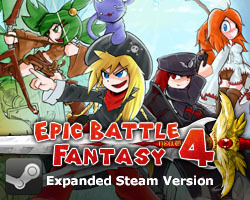 EBF4 and all your games are amazing, though. I hope you make big bucks doing what you love. how to solve the ice block puzzle in battle mountain? in the battle mountain i keep getting weapons i already have. does this affect my current weapons? why do u make it so that battle mountain dont give exp and ap and money? I can’t seem to reproduce this. More information would be appreciated. i just saved refresh the page and load save. it was auto save. maybe its my browser flash kinda lagged? btw i can also move through those stone blocks. Yesterday, after getting Lance, I returned to the village, saved, and quit for the night. Today, when NoLegs randomly activates, he does so TWICE in a row. Handy! But probably a glitch. Another thing, While fighting Armored Oak at level 11, he killed the entire party with his mouth cannons. Natz was swaped for Anna, and Lance, for some reason, got back up from the dead to counter attack armored oak. He then stood there, like everything was normal, despite being dead. I’m confused, because I am playing EBF4 on this website, went to factory, and found out that fish and gunslingers are still weak to lightning. Same with old-skinned cats and slimes. I’ll have to check this out later to see what I find but this looks nice! Oh my god, you are annoying. You’re like an eight year old. If you call that “annoying”, then you probably have not seen enough. I’ve seen it all, man, I know what is annoying. This just isn’t it. what if i am an 8 yr old. Then you have a good excuse. I have the premium version on Armorgames and it seems that it is not updated. Do u have plans to do so, or am i just screwed?